Q. What motivated you to create this software, and why have you maintained it for so many years? Since I was a MSX user, I was interested in developing creative tools. I first began by developing a pixel art animation editor named Animecha on the MSX2 platform. I sometimes consider it to be a prototype to GraphicsGale. By the way, sample2.gal in the GraphicsGale folder is a copy of an animation created in Animecha. Actually, the reason that I began to develop the GraphicsGale was a request from my best friend. He is a video game graphic designer, and he wanted a pixel art editor which could create an animations quickly and had a layer system. I accepted his request because I thought that creating my own graphics editor would be very useful for my game development efforts. GraphicsGale has been used by our visual novel development tool, online games, and other projects. 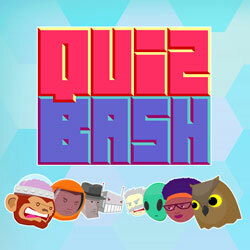 Now it is used to create graphics for html5 games. I hardly create a pixel art myself, however I still personally consider it to be an essential tool. The reason that I continued to maintain it was that many users supported me. I was glad to find out there were many pixel artists in the world. I'm grateful for all purchases, bug reports, and suggestions I have recieved until now. I was also surprised about the number of translations which have been made and appreciate all translators. Q. When you started working on GraphicsGale there was not as much graphics software available as today. Some of the features such as palette management seem to behave in a very original way! What inspired their design? At the time, many graphics editors could not handle pixel and color indexes correctly . That is also one of the reasons I developed the GraphicsGale. 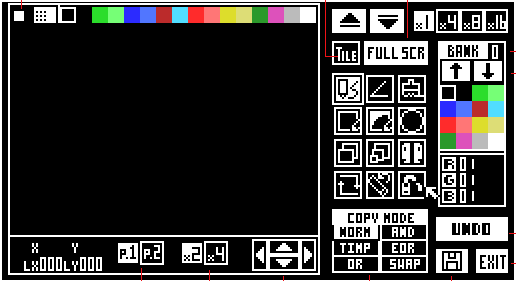 I think that the color palette management design was influenced by some pixel art editors which I used on the MSX2. Q. One of my favorite GraphicsGale features are the special spritesheet import and export functions. I even use these to quickly rearrange tilesets! Was it your game graphic designer friend who inspired you to make these, or how did they come to be? been implemented yet that are in my ToDo list. Q. Speaking of this todo: Now that GraphicsGale is freeware, do you plan to still keep on developing GraphicsGale in the future? Or do you have other plans for new pixel applications? I intend to continue to develop it. However, I don't intend to sell it or release a new shareware version. Also, I still haven't decided on a plan to complete major updates. Currently GraphicsGale is for Windows only, but I hope to make it compatible with other platforms. I'm currently learning several cross platform development tools which will help me achieve this. Q. Why did you make the (wonderful) decision to release GraphicsGale for free? GraphicsGale has enough value on its own as a tool to help my game development efforts regardless of whether or not I earn profit from it. Also selling it was inevitably increasing routine work which I didn't want to do and wanted to avoid. My current primary job is to develop free games, and the main income source is advertising revenue. I like the current situation since I can work freely. It was natural for me to provide it for free because the software can be duplicated at no cost and I won't lose anything. I will be very happy if many pixel art pieces are created with GraphicsGale in the future. Q. Do you have any final message you wish to share to the pixel community? I really appreciate all of you. I'm glad to be able to continue to maintain GraphicsGale for a long time. I haven't always been good at English, so I didn't know about pixel art outside of Japan very much. I was surprised and glad to learn that there were many pixel artists in the world. Even though game graphic production techniques change with time, I believe that pixel art will continue to exist as one of the important forms of expression. Finally, I'm grateful to Hapiel. The interview was a rare and interesting experience for me. Does this mean I can get my 20 bucks back? Seriously though, great interview, thanks! Even if the GG is free now, I'm glad I paid the licence many years ago if it supported the mantainance of the program anyhow (that's why I am using an old version, even if I can use the new.. Maybe I'm too lazy). Thank you very much for this Hapiel, and thanks to Tomoya for this fantastic program. Aww thanks, I'll take that as a huge compliment! Of course I have no intention to replace jal, and sadly this amount of activity can't be sustained for long as I'll go on tour this week, and won't be back for another 2 months... Hopefully more people will step up and help out! Great job Hapiel! I consider you the new jal as far as community building and contributions. I paid the $20 about 10 years ago and was a great deal for this awesome software. Because i'm very noobish and i wouldn't be eable to formulate interesting questions. Otherwise, if for some reason i do actually perform it, i will sumbit it to this website. I'm sure that would be interesting, yes! Why don't you go for it? Great interview, good job. You might want to interview the guy behind grafx2 too. Just echoing everyone else -- I appreciate the interview; very interesting! I've been doing a lot of interviews recently, but on quite a different subject than pixels... I'd love to do more in the future if time allows it, but really anyone is welcome to go for it! Fantastic interview! Thanks for taking the time and doing this.